Our exclusive MBAV APC now includes 3D spacer mesh padding along the inner face of the front and back panels for comfort and ventilation! 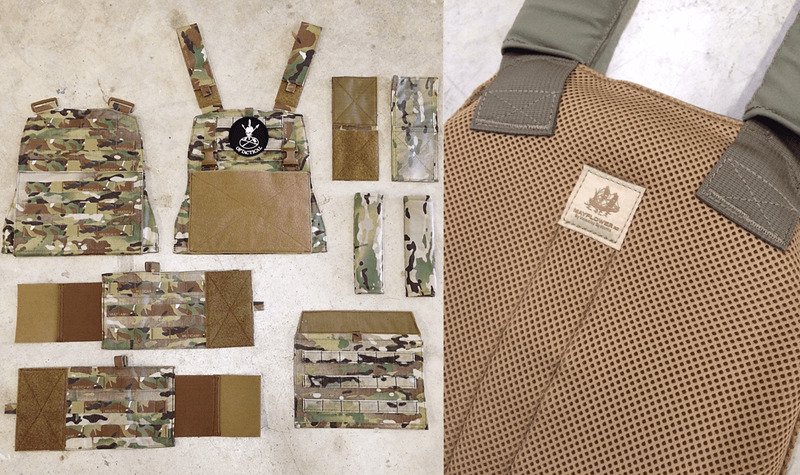 A plate carrier that accommodates USSOCOM issued MBAV (Modular Body Armor Vest) soft armor and SAPI plates. Must feature high degree of scalability, modularity, PALS webbing, QASM compatibility, while maintaining the fundamentals of simplicity in wear and maintenance. THE SOLUTION: OPT's owner approached Mayflower about making simple modifications to the time proven, simple design of the Assault Plate Carrier. 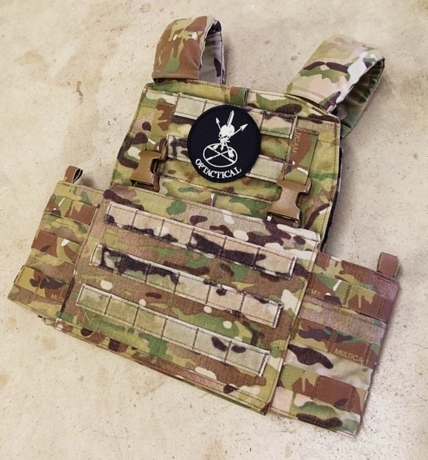 This is an APC sized to hold MBAV soft armor and SAPI plates, with added features of a removable front flap that exposes a pile tape belly area that easily accommodates any QASM compatible placard or chest rig, and updated slim shoulder pads with padding and stretchable tweave covering. THE OUTCOME: An affordable, highly modular, armor carrier, that provides any USSOCOM Operator with a high degree of load flexibility, and mobility; whether in training, or on the battlefield. • Updated slim Shoulder Pads with thin padding for comfort and tweave stretch covering for running comms wiring and hydration tubing through. These are very similar to shoulder pads found on the Scarab LT Plate Carrier. Note: shoulder pads on the Multicam Tropic model are Ranger Green color since Tropic pattern is not yet available in tweave material. • The upper front of the MBAV-APC contains an integral admin pouch with internal elastic loops to retain pens, pencils, chemlites or similar items. This pouch has a wider opening than the standard APC and can fit larger documents easier. • There is an additional pocket in front of the admin pouch to hold quick access documents like maps/index cards. • The front lower half of the APC has a velcro kangaroo pocket sized to hold up to three M4 sized magazines. A triple M4 pouch insert is available separately to fit this pocket. When using a triple mag insert, only hard plates that are less than 0.75 inches thick will fit properly. Plates that are 0.75 inches or thicker may have issues fitting into plate pocket when triple shingle is used and all 3 mags are in the shingle insert. • The MBAV-APC comes with a removable front flap that attaches via Hook tape backing, and a folding upper tab that secures into the kangaroo pocket for a more secure hold and increased load carrying capability. Front of the flap has MOLLE/PALS webbing for pouch attachment and also features 3 rows of velcro loop for use with placards and chest rigs. • Cummerbund is made to fit thin 6x6 inch side plates. Soft armor inserts will also fit in a separate pocket. Use same size Velocity Systems soft armor cummerbund insert as the size of the cummerbund. • The MBAV-APC features removable SwiftClip® Buckles on the front of the carrier to allow the individual to mount various chest rigs and placards directly to the carrier. This configuration allows the individual to use the same loadout with or without armor or have multiple rigs configured for different mission requirements. • Front/Back panels feature an internal plate strap to secure Hard plates and soft armor in place and adjust ride height in the pocket. Front/Back Panels available in two sizes; Small/Medium and Large/XLarge. Cummerbund available in 4 sizes. The plate pockets are sized to accommodate stand alone or in-conjunction with SAPI/ESAPI or Swimmer cut plates. Sized to fit MBAV soft armor or regular SAPI plate backer soft armor.Extensive testing has proven plate shifting is not an issue. The S/M APC will fit small, medium and 10”x12” sized plates. The L/XL APC will fit large and extra-large plates. Cummerbund has a wide range of adjustment, when in doubt go with the larger Cummerbund size, as your armor will increase the diameter once in the carrier. S/M1 is best suited for users who wear Small or Medium SAPI Plates and have a thin waist (32 inch or less). Most users who wear Medium SAPI plates will need the S/M2 size. Most users who wear Large SAPI Plates will need L/XL3. L/XL4 will accommodate users who have a wider waist line and use Large or XL SAPI Plates.